Fed Cup Tennis 2019 - Evans Audio Visual Staging Ltd. 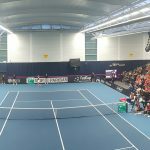 The International Tennis Federation awarded co-hosting rights to the LTA and the University of Bath for the Europe/Africa group stage of the Fed Cup, the premier international women’s Tennis tournament. Based within the University’s Sports Training Village, the eight-court indoor hall was transformed into a 2000 capacity venue with two courts. Evans Audio Visual Staging provided a Nexo Geo wide dispersion line array flown above centre court for announcements and score calling. The umpires were provided with our Shure ULXD handheld radio microphones on a gooseneck stand clamped to the umpires chair. Evans also provided a Nexo PS8 PA system and microphone for court 1. 36 bays of black wool serge pipe and drape were used to section off the different seating areas and to mask the temporary staircase and balcony areas. The dojo was transformed into a VIP area with double sided drapes and portal doorways. This entry was posted in News and tagged Drape, Fed Cup, LTA, Nexo, Tennis. Bookmark the permalink.